1553 Rainbow Shot Glass - #1 Mom - 6 Assorted Colors ..... $18.00/Dozen. CUSTOM IMPRINT AVAILABLE. 1551 Rainbow Shot Glass - Drunk #3 - 6 Assorted Colors ..... $18.00/Dozen. CUSTOM IMPRINT AVAILABLE. 1550 Rainbow Shot Glass - Drunk #2 - 6 Assorted Colors ..... $18.00/Dozen. CUSTOM IMPRINT AVAILABLE. 1549 Rainbow Shot Glass - Drunk #1 - 6 Assorted Colors ..... $18.00/Dozen. CUSTOM IMPRINT AVAILABLE. 1548 Pilsner Shape Shot Glass W/ Glitter Palm Decal - 3 Assorted Colors ..... $ 24.00/Dozen. CUSTOM IMPRINT AVAILABLE. 1547 Metallic Shot Glass Palm Tree Design - 3 Assorted Colors ..... $ 21.00/Dozen. CUSTOM IMPRINT AVAILABLE. 1546 Crackle Effect Shot Glass Dolphin Design 3 Assorted Colors ..... $ 18.00/Dozen. CUSTOM IMPRINT AVAILABLE. 1543 Foil Wrap Ceramic Shot - Sunset Design..... $ 18.00/Dozen. CUSTOM IMPRINT AVAILABLE. 1527 Resin Dolphin Shot Glass ..... $ 18.00/dz. CUSTOM IMPRINT AVAILABLE. Resin Flip Flop Shot Glass - 3 Assorted Designs. 1484 Resin Flip Flop Shot Glass 3 Assorted Designs ..... $ 18.00/dz. CUSTOM IMPRINT AVAILABLE. 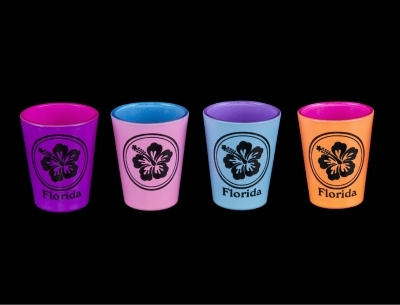 1468 Double Neon Shot Glass - Hibiscus Design ... $ 21.00/dozen. CUSTOM IMPRINT AVAILABLE. 1465 Double Neon Shot Glass - Leaf Design ... $ 21.00/dozen. CUSTOM IMPRINT AVAILABLE.